Online banking is the fast, free and convenient service that lets you access your accounts online to complete most transactions. 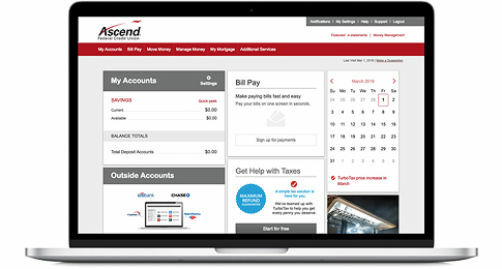 Securely chat with an Ascend representative without leaving your online banking session. Create a budget, manage debt, track investments, and more for free with Money Management. Move money conveniently between financial institutions or individuals using external transfers and Popmoney. 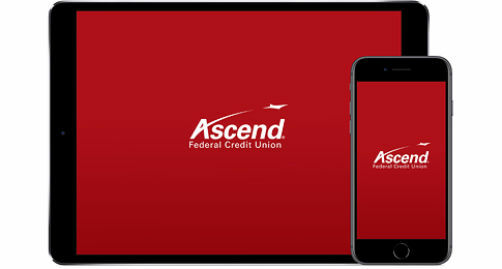 Signing up for online banking is easy. To register, simply click below. In the upper right portion of the My Accounts section, you will see the Make a Transfer button. Clicking the button opens the Move Money window. Select the From and To accounts, enter the transfer amount and memo text, if needed, then click the Transfer button. When you click the Transfer button, you will get a message asking you to confirm the funds transfer. When you click the Make Transfer button, a transfer complete window will display with all of the relevant transfer details and the option to Make another transfer or Print the transfer details. Transactions will post immediately when you complete the transfer. Click the Pay link to open the Move Money window. Select the From account from the drop-down list (the available dollar amount will be displayed). Select the To account from the drop-down list (the balance amount will be displayed). Review the Amount to be paid: Interest + Principal. Click the Transfer button and review the payment details. Click the Make Transfer button to complete the payment and display the payment details.